Ray Goodwin, canoe master at work. Ray Goodwin is something of a living legend of British canoeing. 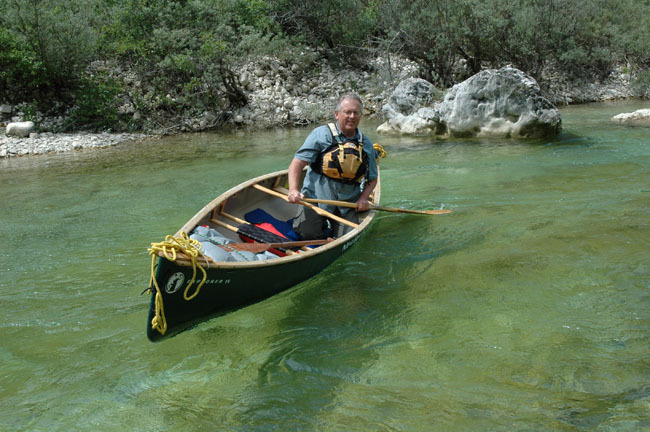 He has been a pioneer of the open canoe in the UK and many consider him the UK’s foremost canoe coach. He is certainly the best known. He was the first coach to be assessed at the highest level (BCU Coach 5) in three disciplines – Canoe, Inland Kayak, and Sea Kayak. Ray is a ‘technical expert’ under the UK’s Adventure Activities Licensing Regulations 1996 and as such he advises outdoor training centres on safety and good practice in the outdoors. 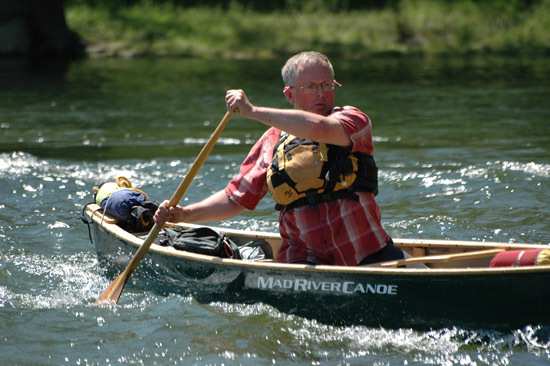 He is an active writer in the field of canoeing with his articles appearing in various publications. Ray wrote two chapters of the BCU Canoe and Kayak Handbook as well as sections in the standard UK textbook on White Water Safety and Rescue. 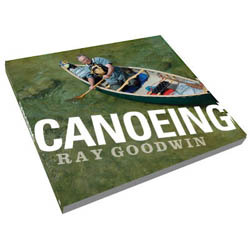 Ray’s highly-anticipated new book Canoeing was released on 6 July 2011. Ray’s paddling career has taken him far and wide. He practices what he teaches and has paddled on four continents. Naturally he has paddled all over the UK as well as extensively in Europe. His ground-breaking British canoe journeys include the first circumnavigation of Wales and the first unsupported canoe crossing of the Irish Sea, as well as grueling journeys across Scotland. Ray’s North American canoe expeditions have taken him south to the Rio Grande and as far north as the Arctic Circle. Nor have Ray’s American exploits been limited to open boats; in kayak he has made two descents of the Grand Canyon of the Colorado River. Even after more than 30 years of introducing people to, and developing people’s skills in, the great outdoors, Ray continues to be an active and enthusiastic outdoorsman. He runs his own canoe coaching and guiding business, working at all levels from novice to the top BCU leadership and coaching qualifications. See www.raygoodwin.com for more details. Ray Goodwin in his natural habitat - the canoe. Ardeche gorge, France. Did you start canoeing at a young age? Ray Goodwin: Actually no; for years my passion was climbing. I only became involved with paddling in my thirties. At first I was dragged out by others, kayaking both on rivers and the sea. Bob Llewellyn, Roger Ward and Loel Collins completed my conversion to paddling. Loel introduced me to the canoe. What was it about the canoe that caught your imagination? 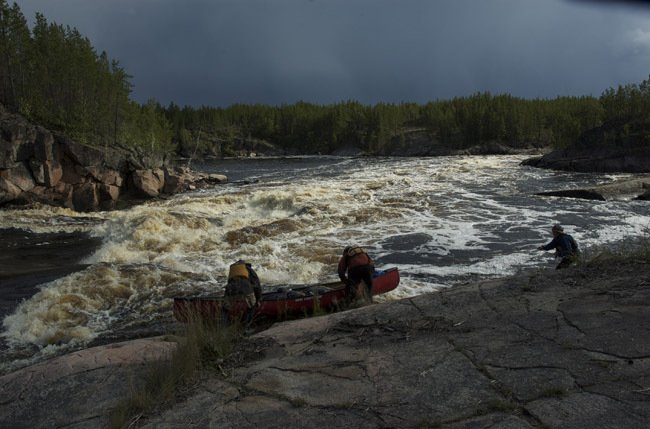 Ray: Well I have always loved expeditioning in remote areas so firstly it was the adventure of the canoe. It is just one of two native watercraft that have gone global (the other being the sea kayak). Now it’s far, far more than that. I still love the adventure but the movement and grace are a big part along with the companionship of tandem paddling. 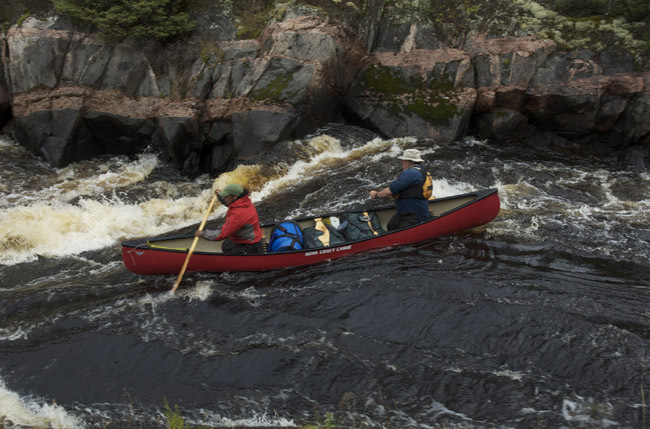 Ray Goodwin and partner Lina paddle tandem on the Bloodvein river, Ontario-Manitoba border. Did you always want to be an outdoor instructor/guide? Ray: At the age of sixteen I joined the Venture Scouts. I was inspired by our leader Geoff Warren and the adventures we undertook. He undoubtedly set me out on this path. I started instructing in the mountains at the age of nineteen and got my Mountain Leader qualification by the time I was twenty-one. I then qualified as a teacher and spent four years in a classroom. Despite being let out at weekends, this wasn’t enough and I eventually returned to full-time outdoor instruction. Once I had become involved in paddling, it was natural to then become involved in coaching. In the world of canoeing who has inspired you? Ray: In canoe Rob Egelstaff has got to be top of the list. His ability as an expeditioner inspired me. With regard to coaching a wide variety of coaches, paddlers and clients have inspired and influenced me over the years; including Harry Rock and Cliff Jacobson from North America. What advice would you give to people who want to take up a career in outdoors instruction? Ray: You must have a real passion for the activities and so are out there having your own adventures. Secondly chase the qualifications remembering that these will be backed up by your experience. But overall you need to maintain your enthusiasm for the activity and working with people. Ray Goodwin clearly demonstrates his passion for the canoe; movement and grace while surfing in the Ardeche, France. Ray: I love guiding: so good trips either in canoe or sea kayak are fantastic. All aspects of coaching I find exhilarating – it’s creative, analytical and so rewarding. I feel a great sense of satisfaction when the penny drops for the customer and, there is a moment when they realise its all working and its all getting better it has become efficient or smooth. It’s a great job. Ray: I have always been an avid reader since being a kid so I always wanted to write a book. As my experience of the canoe grew it became obvious this was the book I wanted to write and photograph. The other side of this was that I also felt there was something lacking in canoe books out there at the moment. I felt I had something to say that was distinctive. Which trips/expeditions have you enjoyed most or, at least, have been the most memorable? Ray: This has to be the circumnavigation of Wales back in 1992, done in canoe with Robert Egelstaff. In North America it has to be the Bloodvein but part of this was because the water went ballistic. The Grand Canyon of the Colorado as a kayak trip was just so good I can still remember individual waves and rapids let alone the breathtaking grandeur of the place. Bloodvein water levels "went ballistic" during a trip in September 2008. Do you have any favourite rivers or rivers you would like to return to? 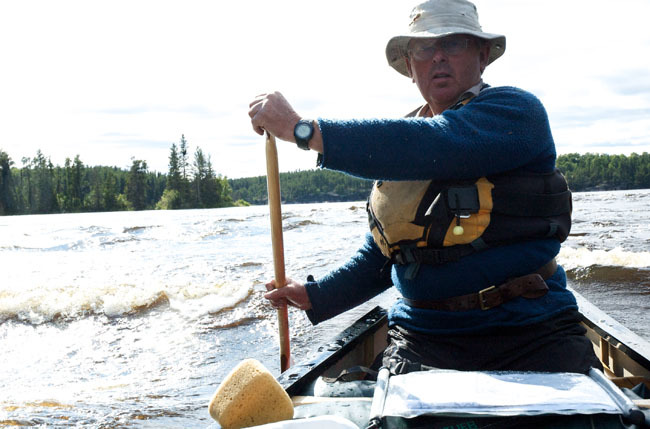 Ray: I’d love to get back to canoe The Bloodvein again; that was an adventure of the top order. And however many times I do it; the Lower Tryweryn is such a good run in canoe. 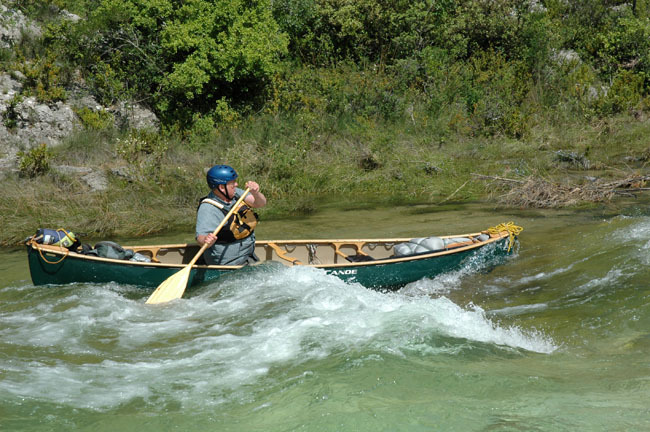 What are the most important skills to learn for paddling an open canoe on a wilderness journey? Ray: Caution! When you are a long way from help you need to remember the consequences of a mistake. Know the limitations of your skills and you only get that by playing hard in easier places. Good quality paddling skills help. 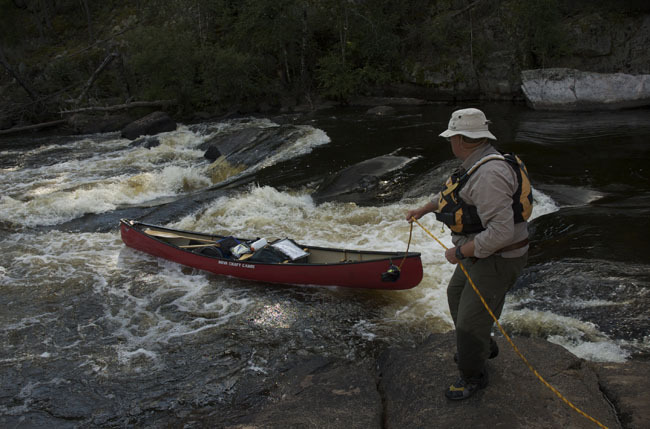 Caution: Lining a canoe on a remote river. Which skills, apart from paddling skills, are the most important on expeditions? Ray: An ability to feel at home with the environment that you travel in. Certainly good navigation, efficient and well honed campcraft for those trips where the weather gives you a beating. What are your favourite foods on expedition? Ray: Anything with lots of flavour but when I am out to impress clients I normally rustle up a pizza or a fresh baked sponge cake; a bit of showmanship. Ray Goodwin on expedition: As enthusiastic and committed to adventure as ever. What luxury do you take on a long trip? Ray: A very good and thick (or difficult) book. So I read the complete works of Jane Austen whilst paddling the Rio Grande, Zen and the Art of Motorcycle Maintenance whilst on a climbing trip in East Africa, Churchill’s History of the English Speaking People whilst in the Darfur region of the Sudan. I am looking for a good trip to read War and Peace on. But after a book the biggest thing is dry socks. Ray Goodwin’s book ‘Canoeing’ is published by Pesda Press. With over 800 photographs used in sequences and photo montages it is lavishly illustrated and covers all aspects of canoeing. ‘Canoeing’ is available from good bookstores, Pesda Press online shop and Amazon.co.uk . Comments are working again. Apologies for the interruption in service….. Brilliant read, cheers Paul, very much looking forward to Ray’s book. Nice article…some instructions on canoeing on the way ? Good interview with a good man.